Figure 1. Thinking aloud about the volume Theorising Media and Conflict. Photo courtesy of Philipp Budka. These notes are intended as a first step towards continuing online with the rest of the EASA Media Anthropology Network the conversation that a group of us began offline at the workshop “Theorising Media and Conflict” held in Vienna on 23-24 October 2015. To provide some context, I start with the original Call for Abstracts (CFA) and the final programme. I then provide brief summaries of the various sessions we held over the two-day meeting, with apologies in advance for any misreported information. (NB. I am grateful to Eva Kössner for sharing her notes on three of the sessions and to Philipp Budka for the photographs). In a recent survey of the interdisciplinary literature on media and conflict, Schoemaker and Stremlau (2014) found that most existing studies display Western-centric biases, normative assumptions and unsubstantiated claims about the impact of media in conflict situations. With their ethnographic methods and ground-up theorising, anthropologists are therefore well placed to make a strong contribution to the advancement of this area of scholarship. Although a growing number of anthropologists have studied media in conflict and post-conflict contexts – working on diverse topics such as media representations, cyberwar, internet activism, social protest, video-making, or radio dramas – so far they have done so in relative isolation from one another. The result is a fragmentation of the field and a dissipation of efforts. The aim of this workshop is to remedy this situation by bringing together media anthropologists and other media and communication scholars working on the complex relationship between media and conflict. What is the present state of anthropological and interdisciplinary knowledge on media and conflict? What are the main questions in need of urgent research and writing? How can media anthropologists and others contribute to the interdisciplinary effort of theorising the elusive relationship between media and conflict? What topics and themes should an edited volume arising from the workshop focus on? In addition to its networking function, the workshop will lead to an edited volume provisionally titled Theorising Media and Conflict. This will be the third in the European Association of Social Anthropologists (EASA) Media Anthropology Network’s series of theoretical volumes published by Berghahn. The first volume came out in 2010 as Theorising Media and Practice (Bräuchler & Postill, eds), and the second volume, Theorising Media and Change (Postill, Ardevol & Tenhunen, eds) is forthcoming. The aim of the series is to place media anthropology at the forefront of theoretical advances in both anthropology and media and communication studies. The session opened with a paper by Laura Pérez Rastrilla (Universidad Complutense, Madrid) titled ‘Ideology, power and language in armed conflicts’. This talk was based on doctoral research into how the Spanish media covered the bombing of Yugoslavia in 1999. It aimed at setting up a theoretical framework (Derrida, Foucault, Laclau, etc) and key concepts such as intertextuality, name-events and genealogy. The issues raised in the Q&A included the distinctiveness of present-day digital media in relation to those of the late 1990s, media effects on politics and diachronic methods of analysis. Tim Markham (Birkbeck, London) presented another theory-driven paper on ‘Caring about mediatised conflict: phenomenological perspectives’. Tim suggested that caring about a conflict is an emotional response that cannot be reduced to understanding, and called for phenomenological interventions that ‘allow for different habits [of mediatised conflict engagement] to congeal over time’. The Q&A covered questions about how we invariable care about some sufferers more than others (Butler), whose phenomenologies are we talking about (e.g. those of white-middle class Western audiences? ), and the problematic notion of a ‘civil war’ in Syria. Finally, the ethno-musicologist Matt Sumera (Minnesota) talked about ‘Audiovisual nodes of musical destruction: theorising the resonances of war’s representations’ in the context of fieldwork on the sounds and music used by American consumers of military films, documentaries, video games and other media genres post-9/11. Matt argued that the sound of music is not about war but rather an integral part of it. Questions and comments included one about his sources of information and the issue of how to compare US and IS war aesthetics. This second session kicked off with the presentation ‘Weapons of mass disruption’: American cybersecurity and the construction of the internet as a war zone’ by Victoria Bernal (UC Irvine). This is part of ongoing anthropological research into the social history of internet culture in post-9/11 United States and the ‘unprecedented militarization of private civil and social life that now depend on digital media’, with ‘cyberwar’ metaphors ever more prevalent. For Victoria, the way cybersecurity is being framed conflates national security and corporate interests, while largely ignoring the concerns of citizens and including them at best as ‘users’ and ‘consumers.’ One workshop participant wondered during the Q&A whether this was really a post-9/11 phenomenon or whether it had deeper roots, which raised the issue of the ‘Snowden effect’ since 2013. Victoria also discussed briefly the language of ‘cyberwar’, corporate recruitment of hackers, and hackers’ own militarised language. The next speaker, Peter Hervik (Aalborg), gave a talk about ‘Danish exclusionary reasoning on social media and Web news commentaries’ based on analysing discourses on race, ethnicity, Islam, and so on. Of particular salience were taken-for-granted cultural frameworks, morality and moralising tendencies, as well as identity categories. Responding to a question from the floor, Peter suggested that these entrenched categories and frameworks go back further than 9/11 or Huntington’s ‘Clash of Civilisations’. He also addressed queries concerning moralism and the mix of metaphors used by Danish Islamophobes and their enemies. In addition, he mentioned how, to his surprise, online hate speech will sometimes find a way into mainstream TV in Denmark. Johanna Sumiala (Tampere/Helsinki) rounded off the session with a paper co-authored with Minttu Tikka and Katja Valasviki (both from Tampere) and titled ‘Media anthropological perspectives on digital witnessing: rethinking distance, proximity and suffering in the case of Charlie Hebdo, 2015’. Johanna made the point that media anthropologists need to unpack notions of proximity vs. distance, real vs. virtual, etc., when studying mediated conflicts and the suffering that they bring about. The Q&A included an exchange about the challenge of following research participants across online and offline sites (according to one participant, as anthropologists we should always ‘follow the people’ to offline contexts, a remark Johanna took issue with); the question of what it means to be a witness – digital or otherwise – during fast-moving, confusing events such as the shooting of a police officer in Paris; the idea of ‘digital mundane witnessing’; and the suggestion that sound is essential to how we experience and frame videos. After lunch we switched to a more hands-on mode, a move particularly appreciated by those of us suffering from jet lag, by initially working in small groups, followed by a whole-group discussion. The aim was to take stock of our current interdisciplinary knowledge of the relationship between media and conflict. In my group we started by trying to map out on a piece of paper our shared knowledge of ‘media and conflict’. This quickly resulted in an ever-expanding archipelago made up of smaller and larger islands of literature, including political communication, (media) anthropology, mediatisation, media studies, visual cultural studies of war, and internet activism. Curiously, the ‘media and conflict’ island was never to be found! This made us change tack. We now asked ourselves about key concepts, which generated ‘trauma’, ‘suffering’, ‘violence’, ‘ritual’, and others, but still left us unfulfilled. So our third and final attempt at finding a common ground was to try and trace our own trajectories into this topic, at which point we ran out of time. Meanwhile Eva Kössner’s group also discussed notions of media and conflict, as well as definitions, who the actors are, and media and conflict as subjects of debate. They then went through a number of different kinds of possible logical relationships obtaining between media and conflict, e.g. media about conflict; media as producers, representations and objects of conflict; media as spaces where conflicts are enacted, performed, etc. ; media as a way of obscuring conflict… In addition, they noted that the political is often overvalued in discussions of media and conflict; that the meaning of a mediated conflict changes with the context (an anthropological point); that the everyday is important and that conflict is becoming increasingly mediatised. On reconvening as a whole group, we listed on a flipchart some of the main ideas or notions arising from the small-group exchanges, including the contested character of mediated conflict, ritualised oppositions, everyday life, ethnography, bottom-up research, cultures of conflict, making sense of conflict, spatiality, temporality, ‘follow the conflict’, and the contemporary moment. On Day Two we started with a set of presentations on how state and non-state actors ‘spin’ conflicts through PR and other techniques. James Rodgers (City University London) delivered the paper ‘Almost as important as the military battle? Government media policy in 21st century conflict.’ James drew from his research on the Georgia-Russia war of 2008, the Israel-Gaza conflict of 2014 and Russia’s continued involvement in Ukraine to argue that as spin increasingly replaces policy in contemporary conflicts, mainstream and social media coverage becomes increasingly important (and contested). Social media in particular have become of keen interest to governments in recent years. Unfortunately my notes on the Q&A appear to have gone missing (a government conspiracy?). The second presenter, Virpi Salojärvi (Helsinki), discussed ‘The role of media in the Venezuelan political conflict during the last years of Hugo Chávez’s presidency, 2010-2012’. Through theories of power and Gramscian hegemony, Virpi tracked the difficulties of having a civil conversation online in Venezuela within a highly polarised, sectarian media landscape in which numerous voices are excluded. The subsequent questions included why TV but not the press are under government control in Venezuela; fluid vs. static models of the news media (or informational) landscape; and the role of foreign media. We completed the session with a paper by Nina Grønlykke Mollerup (Roskilde) on ‘Egyptian activists and state supporting media: unlikely media alliances in revolutionary times’. Nina contended that revolts make for strange media bedfellows (Peterson 2011) or ‘unlikely media alliances’. Citing the work of Ingold, Massey, and Pink she then explored the place-making, sensory qualities of protest media practices in different Egyptian sites during the recent uprising. The Q&A covered the topics of media and place-making (especially the question of what is distinctive about media artefacts compared to non-media artefacts), communicative ecologies, and the music of protest songs. After the break, we had a final round of presentations chaired by Philipp Budka (Vienna) under the working title of “Mediated conflict and collective identities”. Katrien Pype (Leuven and Birmingham) opened this session with her talk ‘Music and the internet as platforms of political activism in the Congolese immigrant space’. Following on nicely from the previous paper’s focus on place and space, Katrien explored the digital practices and political subjectivities of a migrant Congolese collective known as the Combattants to suggest that they have transformed their diasporic space into an online ‘zone of rebellion’ that follows and intervenes remotely in events back in the homeland. There were questions and comments about the peaks (e.g. election times) and troughs of Combattant activity, the ‘poetics of silence’ (censorship) and breaks in media content circulation around boycotted pop celebrities, and about the ‘semantic density’ of contested music events. The second presentation was Oren Livio’s (Haifa) ‘Conflicting emotions: Israeli-Palestinian social media dialogue in wartime’, namely during the 2014 Gaza war. Oren described the contradictory discursive performances of Israeli activists who used humour both to critique war but also as a way of asserting their sophistication and in-group solidarity vis-à-vis their Palestinian counterparts. There were questions from the floor about the times of heightened conflict, about the meta-commentary level of activists’ commenting practices (Hobart), and comparisons with Venezuela and Egypt. Finally, Nico Carpentier (Uppsala) and Vaia Doudaki (Cyprus UT/Uppsala) presented a paper co-authored with Yiannis Christidis (Cyprus UT), who was absent, titled ‘Technological struggles in community media’. On the basis of two contrasting case studies, namely CUT radio in Cyprus and the Community Media Forum Europe (CMFE), Nico and Vaia argued for the need to study not only the role of media in societal conflict but also conflicts within media organisations and networks, more specifically ‘how conflict, struggle and difference become managed within a participatory setting’. The Q&A centred on the authors’ use of agonistic theory (Mouffe 2005) to study media agents who ‘share a common symbolic space within which the conflict takes place’ – a space where competing discourses interact. This brought us once again to the problem of place-making (e.g. within Cyprus’ buffer zone), as well as to ritual space (Rothenbuhler). 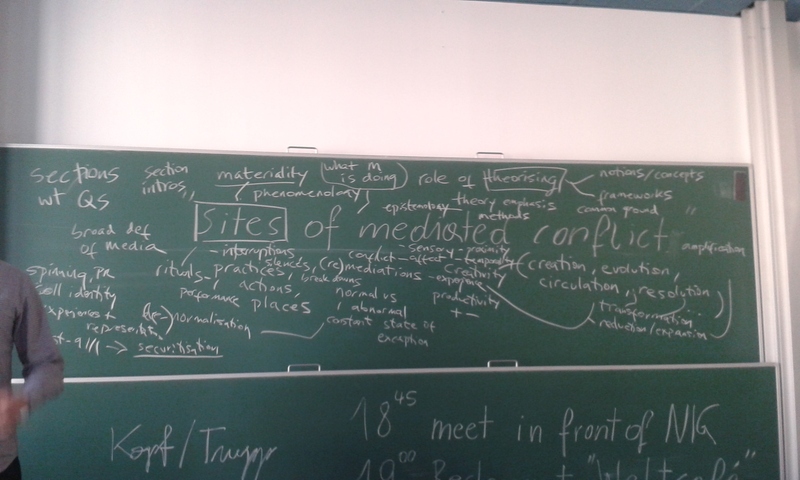 In this second and final brainstorming session we began to think aloud about the shape of the edited volume to arise from the Vienna meeting, provisionally titled Theorising Media and Conflict. We started with the suggestion that one way of bringing the various papers together into a coherent volume with a strong editorial voice would be through the tagline “Sites of mediated conflict” (see Figure 1). Thus the notion of ‘sites’ may help to gather together ideas that cropped up throughout the two-day meeting such as (mediated) place-making, materiality, phenomenology, rituals, performances, actions, practices or habits. For its part, the concept of conflict could be modified in different chapters through permutations such as conflict creation, circulation, evolution, reduction, amplification, transformation, resolution, etc. This opening gambit generated a wide range of responses, including the questioning of ‘mediated’ as a core concept, the issue of what media are doing in different conflict situations, the role of ‘theorising’ in the book (e.g. primarily through concepts or, alternatively, through an overall framework? ); the importance of media creativity and transformation; securitisation as a potential keyword; the need for a broad definition of media, and others. As to whether the book ought to be divided into the same sections as the workshop, the consensus was a clear ‘No’. We also briefly discussed whether sections should come with their own separate introductions or key questions, or whether it was best to leave this to a general introduction, as is the case in the first volume in the series, Theorising Media and Practice (Bräuchler and Postill 2010). Amidst the flurry and messiness of this exercise, one thing was clear. As a colleague from media sociology pointed out, although this will be an interdisciplinary volume, it should still play to the ethnographic, cross-cultural and theoretical strengths of anthropology in order to make a distinctive contribution to this area of scholarship. We wish to thank EASA, the Austrian Research Association (ÖFG), and the Department of Social and Cultural Anthropology, University of Vienna, for their generous support of this event.